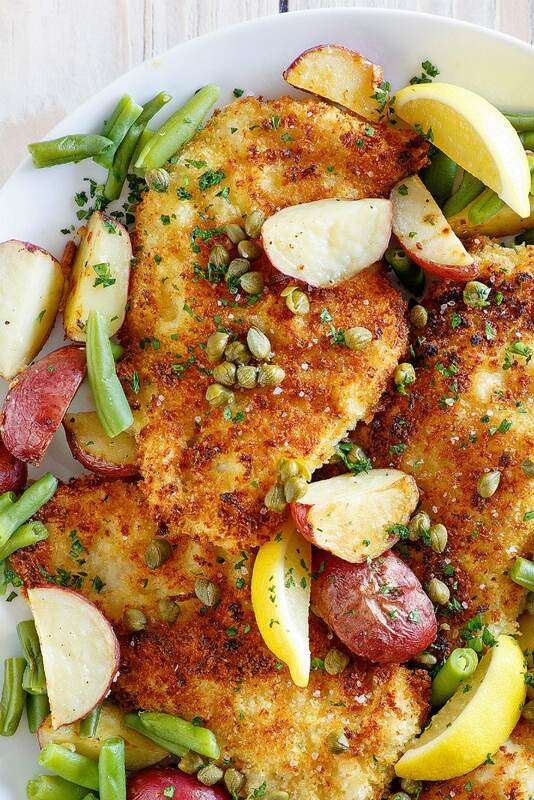 In this Crispy Chicken Schnitzel recipe, you’ll see a healthier way to make this classic dish. It’s baked in the oven instead of being fried in oil. And there are added vegetables to create a complete dinner. A New Year is upon us, and I know a lot of people have likely taken the plunge into making healthy eating choices to rid themselves of those extra pounds that somehow crept on during the year. 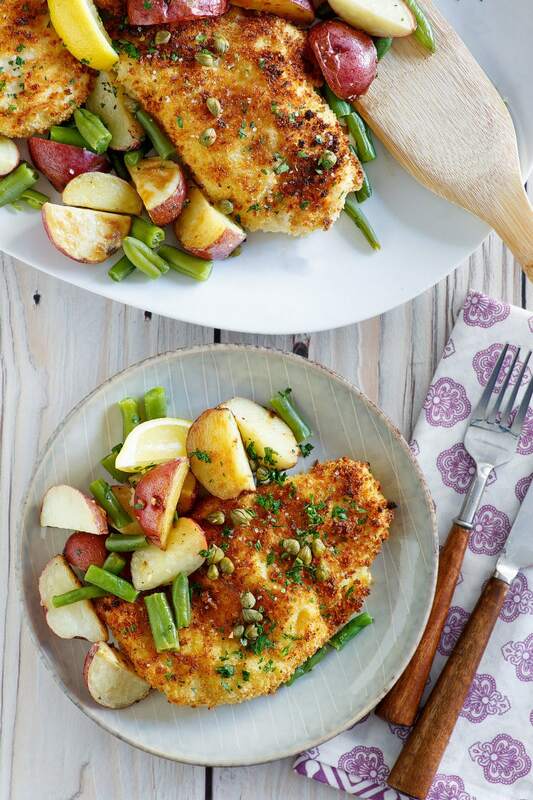 This Crispy Chicken Schnitzel is a good meal to make when you’re on your healthy eating venture. If you’ve had Schnitzel on your European travels, this recipe is much lighter than what you might be expecting. Schnitzel is meat that is usually pounded thin with a meat tenderizer. The meat is then coated with flour, egg and breadcrumbs and fried until crispy. 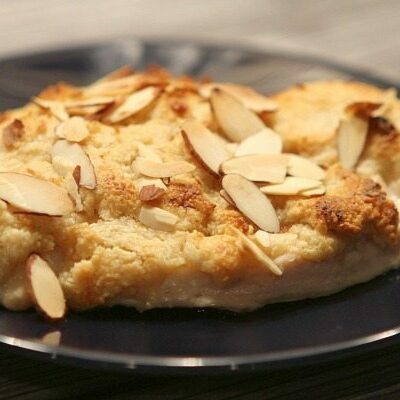 Schnitzel originated in Austria, but different versions of it are now popular in many other countries. 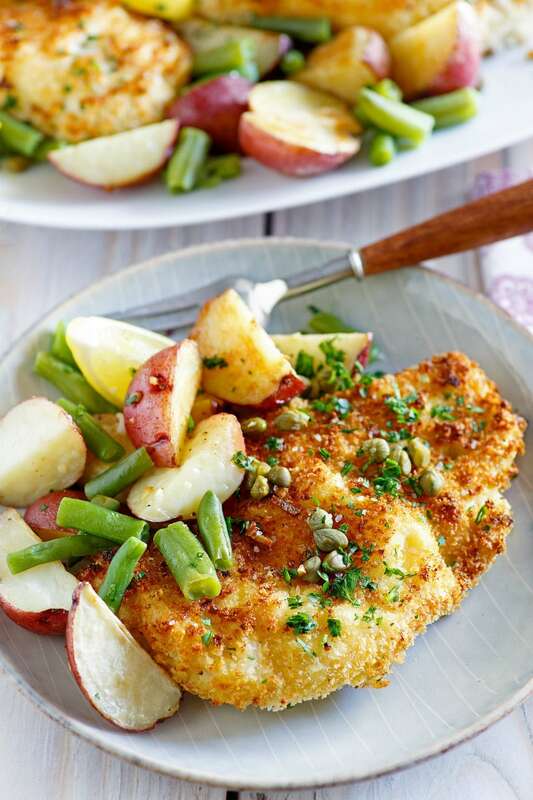 In this recipe, chicken schnitzel is coated with olive oil cooking spray and is baked to get that crispy effect. I’m happy to share this recipe from my favorite new cookbook: Skinnytaste One and Done by Gina Holmolka. 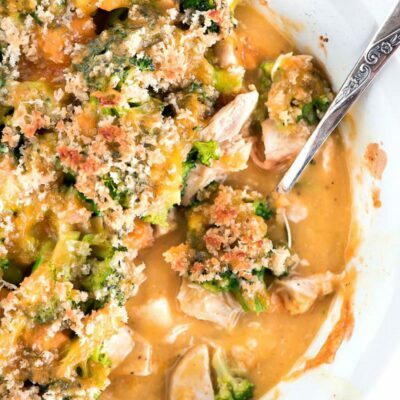 Gina is the creator and author of Skinnytaste.com, a website devoted to recipes made healthier. Gina includes Weight Watchers Freestyle SmartPoints on her website recipes too. Skinnytaste.com is my go-to website for new, healthy dinner ideas! If you’ve ever tried a recipe from Skinnytaste.com, then you know that the recipe will be really good. Gina explained to me once what her process was like to develop, test and re-test recipes. It’s extensive. And she never publishes a recipe unless it absolutely works. That’s a good plan. Her recipes on are point! 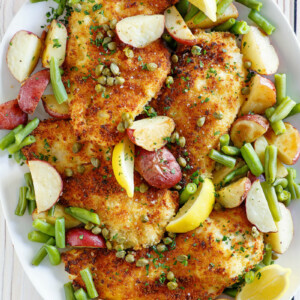 This Crispy Chicken Schnitzel recipe is so delicious! This cookbook includes 140 delicious, healthy and indulgent recipes with minimal fuss to prepare. Every recipe includes a vibrant, color photo along with nutritional information. Here are a few favorites that I’ve bookmarked to make: Lazy Veggie Lasagna, Chicken Cordon Bleu with Asparagus, Jalapeno Popper Frittata with Pico de Gallo, Carne Asada Fries, Honey Mustard Chicken Bake, Buffalo Chicken Nuggets, Spicy Shrimp Tempura Roll Bowls, London Broil with Tomatoes, Red Onion and Balsamic, Kielbasa and Cabbage, Cheesy Turkey Taco Chili Mac, Chipotle Chicken Tostadas, Chicken Avocado Burgers with Jalapeno Slaw and Shortcut Vietnamese Chicken Pho. This is a great cookbook to add to your cookbook collection! The One and Done concept that Gina shares in her new book is so great for those of us who don’t want the big hassle of a mess while trying to make dinner. Each recipe is made start to finish in one pot or pan, whether that’s an Instant Pot, air fryer, slow cooker, sheet pan, grill pan, Dutch oven or a skillet. I don’t know about you, but that makes like so much easier for me when I’m finished with dinner and it’s time to do the dishes! 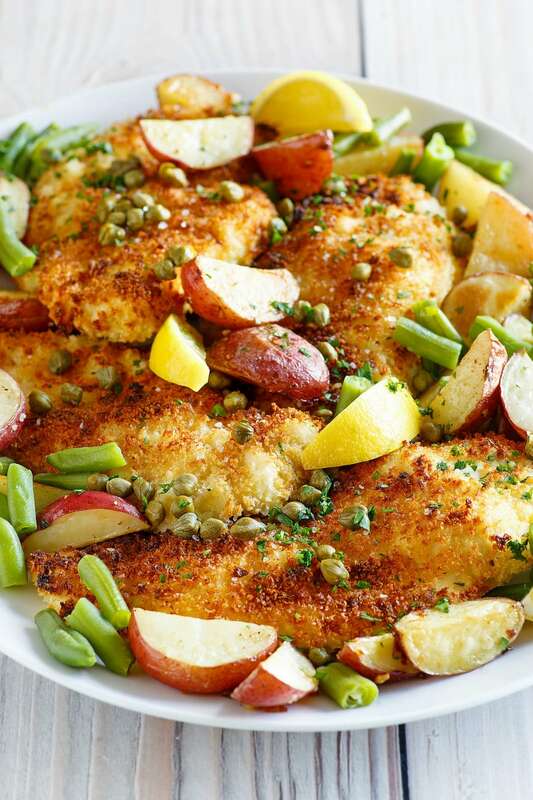 Crispy Chicken Schnitzel is cooked on a sheet pan. My family really enjoyed this dinner. We loved that it was crispy, but not deep-fried. And it was easy clean up too! Since I’m up and down with my weight pretty much all the time, I often follow the Weight Watchers diet plan to get back on track. So I happen to have a pretty large section of Weight Watchers recipes here on RecipeGirl. I especially pay attention to my Zero SmartPoints Recipes and my One SmartPoints Recipes to help keep my point counts really low. Since chicken breasts are “free” on the Weight Watchers program, I do make a lot of chicken while following the plan. That’s why I chose to make the Skinnytaste Crispy Chicken Schnitzel. 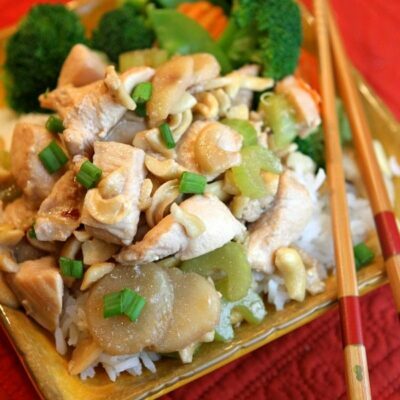 Here are some more of my favorite weight watchers chicken recipes. What is a sheet pan? A sheet pan is basically a heavy, rimmed cookie sheet. I have so many sizes of sheet pans in my kitchen, and I find that I use them all the time for so many things besides baking cookies. The sheet pan called for in this recipe (and the size that is used in most sheet pan dinner recipes) is an 18×13-inch sheet pan. It’s found here on Amazon in a two-pack. If you don’t have sheet pans, I highly recommend buying them as you’ll find many uses for them. I’ve seen them for sale at Costco sometimes too. Can this Crispy Chicken Schnitzel be cooked in another pan? Yes, in a pinch- this dinner can be cooked in another pan if you don’t own a sheet pan. Use your largest pan. A rim for the pan is pretty important since you don’t want anything leaking over the edge. And all ingredients should lay flat- without much overlap- for the best results. 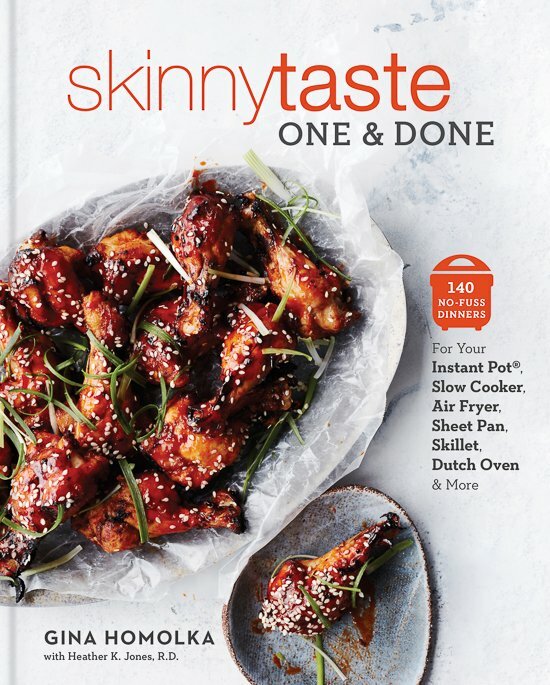 You can find the Skinnytaste One and Done cookbook on Amazon. It’s already a New York Times Bestseller. Read the book reviews- they’re good! Easy sheet pan chicken dinner recipe! Preheat the oven to 425 degrees F. Lightly spray an 18x13-inch large rimmed sheet pan with nonstick spray. 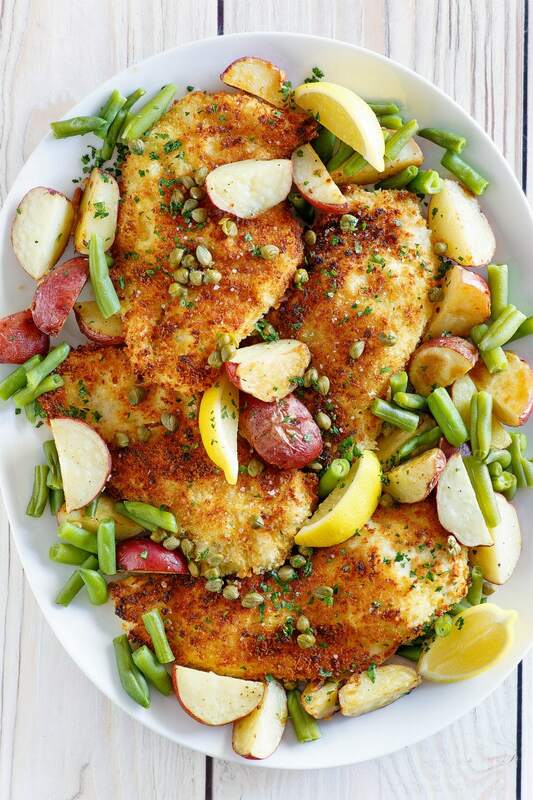 On the prepared pan, toss together the green beans, potatoes, olive oil, garlic, salt and pepper to taste. Spread the vegetables out in a single layer. Bake until partially cooked, about 20 minutes. While the vegetables are cooking, season the chicken with the salt and pepper to taste. Put the flour in a shallow plate and put the egg in a medium bowl. Put the panko in another shallow plate. Dredge each chicken cutlet lightly in the flour, then dip in the egg, shaking off the excess. Dredge in the panko, lightly pressing to evenly coat. Set aside on a plate. Remove the pan of vegetables from the oven, stir them together, the push to one side. Place the chicken on the other side of the pan and spray the tops with olive oil spray. Return to the oven and bake until the chicken is golden and the potatoes are cooked through, about 15 minutes. 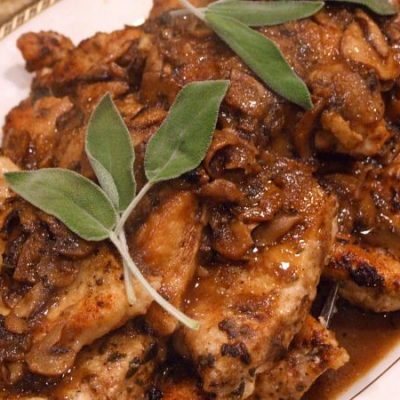 Switch the oven to broil and broil until the top of the chicken is browned slightly, 1 to 2 minutes. Remove the pan from the oven and squeeze the lemon half over the vegetables. Gluten-free adaptions: to make this recipe gluten-free, sub gluten-free flour for the all-purpose and sub gluten-free breadcrumbs for regular. I received a copy of the Skinnytaste One and Done cookbook for review purposes. All opinions shared are my own. There are tips in the “Recipe Notes” section of the recipe to convert this recipe to be gluten-free. Your vegetables don’t look like they’ve been roasted in the oven for 35 minutes at 425 + broiling time. (Which seems like a lot honestly, I’d think that would make them quite overdone?) Am I missing something? Your beans look boiled? Hi Jennifer, I had a chat with the photographer who shot this, and you’re absolutely right… they wanted the green beans to look pretty in the photo, but they should definitely look more roasted. Next time I make it, I’ll snap a “true” photo to add to the post. Thanks for pointing it out! My husband loved this dish and asked me to put it on rotation. It was such a win. Thanks for such a great recipe. Such a fabulous, crispy crust without deep frying! This will be a regular on our dinner rotation! This recipe is absolutely fabulous! Tastiest chicken ever! Light and delicious! What an amazing dish! !